Rapid Water Loss Beneficial For Both Men And Women! New xtreme water release pill allows you to see results in just 12 hours! At any given time, you're carrying up to 10 pounds of excess water. This natural phenomenon is called "subcutaneous water", and it can easily contribute to a "soft and puffy" appearance and uncomfortable feeling. If you're a bodybuilder, subcutaneous water can prevent you from being "dialed in" at your next contest. If you're someone simply looking to lose a few pounds fast, subcutaneous water can prevent you from fitting into those jeans you want to wear this weekend! For Those Looking to Lose Weight... Fast! Women commonly experience excess subcutaneous water around the thigh area, buttocks, even the stomach! They may feel it most around "that time of the month", but it's their water that just won't go away. 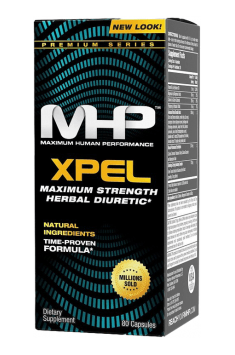 Xpel is perfect for women looking to lose those last 5 lbs to fit into those special occasion dresses, bathing suits and other revealing outfits. XPEL can also be used to jump start the weight loss process for women who are just beginning a weight loss program. First portion (4 capsules) in the morning on an empty stomach and a second portion of the afternoon. It is very important to maintain proper intervals between daily doses, which should be at least 5-6 hours. When taking this product you should provide adequate amounts of fluids. Please note that physically active people have a much greater need for liquids during the day. The supplement contains the alkaloids caffeine and there is a chance that taking it in the evening may cause insomnia. We do not recommend exceeding the daily dosage recommended by the manufacturer of the product. Maximum Human Performance is a manufacturer of products designed for bodybuilders. Among the diet and nutritional supplements, there is glutamine with longer release time, which increases muscle strength and helps to build muscles. The company also offers creatine, testosterone and HGH boosters, amino acids and protein supplements and gainers. Cornsilk it is a herbal material containing allantoin, phytosterols, tannins, essential oils, mineral salts (large amounts of potassium salts), vitamin K and saponin compounds. Diuretic and antispasmodic on the urinary tract, reducing smooth muscle tone; It has a little anti-inflammatory potential. It affects the excretion of phosphate out of the body, urate and oxalate. Used in sports supplementation to remove excess fluids in the mass reduction and improve the aesthetics of the body programs. Hydrangea root extract (Hydrangea arborescens) is a rich source of active substances: alkaloids, flavonoids, phenolic glycosides (e.g. Hydrangeina) isocoumarin, saponins. It has diuretic properties and allows removal of excess fluid from the body, especially contained in the subcutaneous layer, thereby generating a loss of body mass, especially desirable in sports with weight categories (e.g. Boxing, wrestling, judo, etc.) And in the maintenance of body aesthetics. When a long-term use - basic electrolytes should be complemented (magnesium, potassium, sodium). In the sports supplementation - hydrangea root extract is used in body mass reduction programs, as an ingredient of thermogenics and supplements to enhance dehydration. Juniper Berry Fruit is an extract from the fruit of juniper (Juniperus communis) containing phytosterols, catechins, glucuronic acid, proanthocyanidins and other biologically active ingredients. Improves digestion by preventing bloating, constipation, especially when taking a heavy foods. Adjusts the digestive juices while keeping it in balance. It is a diuretic that allows getting rid of excess subcutaneous water, affecting at a fast rate of improving the posture and decrease of body weight. Supplements containing the fruit of juniper supports the body's immune system. In the sports supplementation, extracts from juniper berries are used in order to improve posture and in weight-loss supplements, in particular in thermogenics. The fruit of juniper is also available as a kitchen spice used for various types of meat and processed meat (especially game).